Linda of Calling It Home and I have had a long time running joke about her adoration of driftwood decor and my abhorrence for it. In fact, I doubt she loves it as much as she says and I don't dislike it all that much. But in honor of Linda and her family's move to Florida this summer, I have found a vignette by Joseph Minton that combines Chinoiserie and driftwood that even I love. Don't you agree? 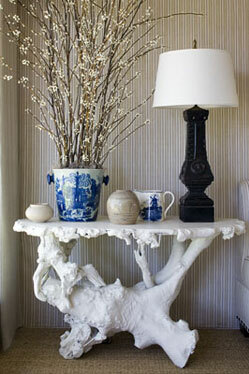 The driftwood table resembles the shape of coral a bit. Maybe that's why it's a little easier on the eyes...Love the blue and white! I do agree, it is a very chic entryway look! Y'all are hilarious! Yes, this is lovely! Now see, I knew it was only a matter of time before I could convince you. Happy Driftwood. You two are hilarious! I'm still laughing about Linda asking you where you keep your flip flops and sneakers in your fab glam dressing room.